My pole beans are doing fantastic. This year I planted some Kentucky Blue string less beans (I think that is their name) and heirloom Rattlesnake pole beans which are said to grow 10 feet long. I believe it is almost there. This is the top of the arbor that my husband built for me. It is a little over 7 feet in height of which the pole beans have grown well beyond that. As you can see they have reached the top of the arbor and are starting their climb toward the middle. In my opinion, I believe that they will exceed their estimated 10 foot length, only to my delight of course. Not only will they provide fresh beans, they will produce a pretty shaded walk way to the back side of my garden. This is the first year of the arbor and it seems to be doing marvelous. Looks great! 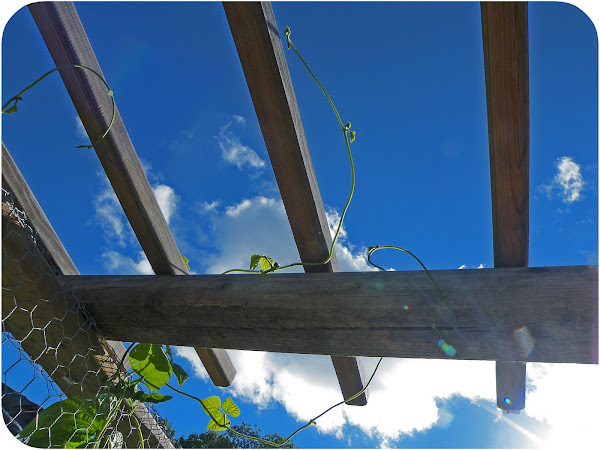 I'm sure they are loving that sunny trellis! I'm growing beans in zone 9 (Bakersfield, CA). Have you had any trouble with grasshoppers? They're starting to wear me down. @Maybelline I have heard that grasshoppers are a problem in your area. Some have described it as biblical. I haven't seen a single one this year and doubt I will. Our nuisances right now are earwigs and wasps.